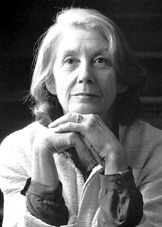 November 20, 1923: Happy 90th birthday, Nadine Gordimer! The novelist and Nobel Prize winner has been an anti-apartheid activist since the 1960s. Sometimes nothing hurts more than not knowing the truth. The truth often means a new beginning. You are absolutely right but sometimes the truth can hurt, too. A very timely and spot-on quote! The full truth regarding the direction our world is going, hurts so much that almost no one dares/wants to face it. Yet, somehow we need to collect enough strength and wisdom to allow ourselves to face the full truth and to realise mankind will not survive without our complete unity and without a global rebellion against the global alliance of the neoliberal political elites, who are rapidly destroying both mankind and this planet. Please read my blog for details. Yes, we must face the truth and act on it. Thank you so much for reading my blog and for your supporting feedback. Knowing that my blog could serve such a good purpose brings me back some of the lost hope. I’m glad that you’re still posting; your blog is very educational. Orwell was spot on. In our times a peacemaker is one who warns everyone that this is NOT peace and we need to fight for a genuine peace. We are at war waged via unfathomable lies, deceit and tricks, and we need to organise ourselves and fight for our righteous self-defence. In case you have missed my “good bye” on my blog, in the meantime I decided to stop writing.after all. I do feel that the truth that I found relevant to share has been told, and I have already found myself repeating the same point in many ways. That blog has arrived at a final point and somehow I would like to keep that point in the centre without diluting it any further. Again, thank you so much for your kindness and for your interest in my writing. It is a great line, we have an instinct for the truth yet sometimes we hide from it. Thank you. Sometimes the pursuit can also hurt, I think. It can all hurt, which only makes the other side of hurt all the more meaningful beautiful you. That’s really sweet, Pauline; thanks. Love this quote! All the happiness of the season to you, Ela. Yeah… like bitters. We need bitters as part of our wellness, not cotton candy.